Introduction: Glaucoma is a neurodegenerative disease. It is presented by a triad of elevated intraocular pressure (IOP), progressive optic nerve damage, and constriction of the peripheral visual field. Objectives: The aim of this study is to assess the ocular hypotensive effects of some drugs used in treatment of open angle glaucoma (OAG) at Alsaym Ophthalmic Hospital, Wad Medani, Sudan. Methodology: A cross-sectional hospital-based study was conducted at specialized ophthalmological health setting. Patients (n = 200) diagnosed with OAG and treated with different anti-glaucoma drugs were selected randomly to participate in this study. The ocular hypotensive effects of anti-glaucoma drugs were evaluated monthly for 4 successive months, by measuring the diurnal IOP for each patient, using tonometer. The obtained data were collected in especial data collection form and analyzed by IBM SPSS Inc. (IBM SPSS Statistics) Software;Group's Business Analytics Portfolio. Results: Monotherapy of timolol (eye drops 0.5% and 0.1% eye gel), betaxolol 0.5% eye drops produced significant reductions in the total mean of IOP, ranged between 4.4 and 6.1 mmHg, while travoprost 0.004% eye drops showed a remarkable reduction of 7.3 mmHg. Combinations of travoprost with timolol and and/or dorzolamide 2% resulted in significant IOP lowering effects, ranged from 8.9 to 12.7 mmHg. Mono or combined therapy with travoprost was found to be superior to other anti-glaucoma monotherapy. Conclusion: The obtained results showed that travoprost produced clinical significant and superior ocular hypotensive effects when used alone or in combination with timolol and/or dorzolamide. It is thus recommended to use prostaglandin analogues in treatment of OAG because they are the most effective agents in reducing the mean diurnal IOP. Glaucoma is a neurodegenerative disease that classically presents with a triad of elevated intraocular pressure (IOP), progressive optic nerve damage, and constriction of the peripheral visual field. The term “glaucoma" refers to a set of diseases with a common end point of progressive retinal ganglion cell and optic nerve degeneration associated with elevations in IOP. Pathological elevation of IOP results from an obstruction to aqueous flow or outflow anywhere along its course from the posterior chamber through the pupil into the ciliary cleft, across the trabecular meshwork, and into the scleral venous plexus or elevated IOP results when aqueous is drained lesser than it can be produced. IOP is the most common risk factor, but not the only risk factor for the development of glaucoma, so consequently the term “ocular hypertension" is used for cases having constantly raised IOP without any associated glaucomatous damage. Glaucoma remains the second leading cause of blindness in human in the world. In spite of many advances in the diagnosis and treatment of glaucoma, the fundamental causes of most glaucomas remain unknown. Although advances in cycloablative surgery and aqueous outflow enhancement procedures have improved the ability to manage glaucoma in animals, medical therapy continues to be an important component of glaucoma treatment. Most medications used in the management of glaucoma are targeted at decreasing IOP. These drugs may be categorized by their basic mechanism of action into drugs that reduce the production of aqueous humor, those that increase aqueous humor outflow without reducing production, and those that induce alteration of both physiological pathways on ocular fluid dynamics. Many of the compounds used in the medical management of glaucoma exert their actions by modulating the activity of the autonomic nervous system, therefore, a number of drugs used in the management of glaucoma target alpha (α), beta (β), or muscarinic receptor sites by competing with the transmitter, or affecting the concentration of a transmitter in the neuro-effector synapse. There are many treatment options available to accomplish the desired target IOP range, however sometimes combinations of these treatments are necessary. The adjunctive IOP lowering therapy is widely used today, as one-third of all patients being treated for glaucoma need additional therapy to reach and maintain their target IOPs. Monotherapy is recommended but in practice most patients will eventually require several different types of glaucoma medication. Presently, the majority of ophthalmologists use either β blockers and/or prostaglandin F2α analogues as first-line therapy. As general, the adrenergic agonists, parasympathomimetics, and oral carbonic anhydrase inhibitors had adverse effect profiles that limited their tolerability. Timolol rapidly advanced to become the most commonly used first-line therapy for the treatment of elevated IOP which has been replaced in recent years by prostaglandin analogues such as travoprost. This study aimed to assess the ocular hypotensive effects of some drugs used in treatment of open angle glaucoma (OAG) at Alsaym Ophthalmic Hospital, Wad Medani, Sudan. This was a cross-sectional hospital-based study was conducted (August 2010–May 2011) in a specialized ophthalmological health setting at Alsaym Ophthalmic Hospital, Wad Medani, Central Sudan. Patients (n = 200) diagnosed with OAG and treated with different types of anti-glaucoma drugs, were randomly selected to participate in this study. The obtained data from the patient with OAG were collected in especial designed form. Different variables were included in this form, including gender, age, tribes, level of education, occupation, family history of glaucoma, compliance with treatments, different doses used, degree of optic disc cupping, visual field monitoring, visual acuity and treatment used. Different anti-glaucoma drugs were used in the treatment of OAG patients including timolol 0.5% eye drops, timolol 0.1% eye gel, betaxolol 0.5% eye drops, brinzolamide 1% eye drops, dorzolamide 2% eye drops and travoprost 0.004 eye drops. The treatment and follow-up of glaucoma patients were continued for four successive months during which the effects of the different anti-glaucoma drugs were evaluated by measuring diurnal IOP using tonometer (manufacturing company, Goldmann Applanation Tonometer; Haag-Streit AG, Koeniz, Switzerland) during four visits every month. All the data were expressed as means ± standard error of means and were analyzed by analysis of variance (ANOVA). Comparisons with the control group were made using one-way ANOVA. Differences were considered statistically significant if P < 0.05. The family history of glaucoma was found in 101 (50.5%) patients with OAG. This agreed with that reported by Weale who mentioned that African- and African-descended patients and others living in warm climates presented a higher prevalence of OAG than do those in temperate zones. Concerning the occupational entities of OAG patients, there were 67 (33.5%) housewives, 45 (22.5%) retirees, 37 (18.5%) workers, 19 (9.5%) teachers and 17 (8.5%) employees, while farmers and students represented the lowest affected groups. In assessment of the degree of optic nerve damage, the cup-to-disc ratios in the right and left eyes of OAG patients were determined. In this study, there was a significant (P = 0.001) relationship between optic disc-cupping and the degree of visual field damage on both eyes. The larger the ratio the more advanced visual field damage and in the presence of persistently elevated IOP, the optic cup becomes enlarged. 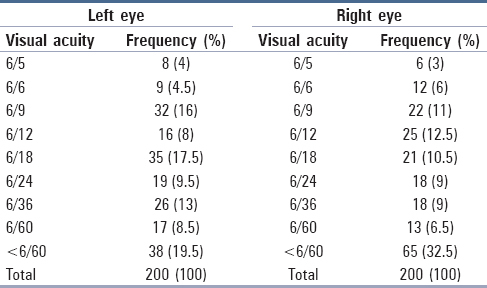 Among the patients with OAG, there were 38 (19.5%) and 65 (32.5%) patients with visual acuity <6/60 for right and left eyes, respectively [Table 1]. These variations may be due to lack of glaucoma screening programs in the area of the study, poor personal eyes care and noncompliance with treatment, besides the presence of some other risk factors such as the advanced age of population under the study. Among OAG patients there were 30 (15%) patients suffered from hypertension, 26 (13%) patients had Type 2 diabetes mellitus and 12 (6%) patients affected by both, while there were 132 (66%) patients with neither hypertension nor Type 2 diabetes mellitus. This may demonstrate some relationship between incidence of OAG with hypertension and/or diabetes mellitus. The reason behind this may be associated with the lack of glaucoma screening programs among diabetic and/or hypertensive patients in the area of the study. Pasquale et al. (2006) found that Type 2 diabetes mellitus was positively associated with POAG. Regarding the treatment of OAG of study population, the most commonly prescribed anti-glaucoma drugs at Elsaym Ophthalmic Hospital were timolol 0.5% eye drops, timolol 0.5% eye drops combined with brinzolamide 1% eye drops, timolol 0.1% eye gel combined with brinzolamide 1% eye drops, and timolol 0.1% eye gel, representing 40, 40, 31 and 25 prescription, respectively [Table 2]. The prostaglandin analogue, travoprost was rarely prescribed at Elsaym Ophthalmic Hospital and this may be attributed to its high expense. The administration of twice daily doses of timolol 0.5% eye drops for 40 glaucoma patients produced a significant (P = 0.001) reduction in the total mean IOP during four visits as of 6 mmHg for the right eye and 6.1 mmHg for the left eye representing reductions of 31% and 31.2%, respectively [Table 3]. These results were consistent with the findings of Hedman and Larsson (2002), who reported that timolol significantly reduced the mean diurnal IOP by 6.4 mmHg in the African-American, Asian, Caucasian, and Mexican, and the degree of reduction appeared to be clinically useful. In the assessment of the IOP lowering effect of a once daily dose of timolol 0.1% eye gel for 25 glaucoma patients, there was a significant (P = 0.001) reduction in the total mean IOP corresponding to 5.35 mmHg for the right and 5.36 mmHg for the left eyes, representing reductions of 31.3% and 29.6% from the base line IOP for both eyes, respectively [Table 3]. It is obvious that timolol 0.1% eye gel lowered the IOP slightly lesser than timolol 0.5% eye drops, however the gel dosage form has an advantage over eye drops, in its once daily dose which enhancing patients compliance with treatment of glaucoma. 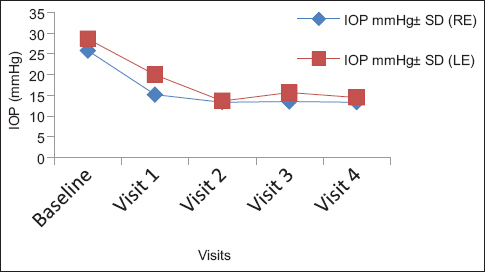 This study demonstrated that the both forms of ocular timolol preparations effectively reduced the mean IOP to target levels for patients with OAG. However Shedden et al. reported that timolol 0.5% gel administered once daily was found to be as effective as timolol 0.5% solution which was used twice daily for patients with OAG. When betaxolol 0.5% eye drops was used by eight glaucoma patients a significant (P = 0.001) in the total mean IOP was obtained (4.4 mmHg for the right eye and 4.5 mmHg for the left eye representing 26.9% and 26.8% reductions, respectively) as shown in [Table 3]. The obtained results showed that betaxolol 0.5% eye drops reduced the IOP slightly lower than that obtained by timolol 0.5% eye drops and timolol eye gel 0.1%. Although betaxolol 0.5% did not offer a great lowering effect of IOP compared to timolol 0.5%, but it is still have a significant lowering effect. It was mentioned that with more than three decades of accumulated experience, the ocular beta blockers remained the favored choice for initial monotherapy for lowering IOP even after the introduction of topical prostaglandin analogues due to their accepted efficacy at lowering IOP, well tolerated and familiar. A significant (P = 0.006) ocular hypotensive effect was obtained by travoprost 0.004% eye drops when it was used by eight glaucoma patients in once daily dose, representing total mean IOP reductions of 7.2 mmHg for the right and 7.4 mmHg for the left eyes as 35.8% and 35.7% reductions, respectively [Table 3]. This effect was greater than that produced by timolol 0.5% eye drops, timolol 0.1% eye gel and betaxolol 0.5% eye drops. The obtained result was consistent with other study which reported that prostaglandin analogues are more effective than timolol 0.5% in reducing mean diurnal IOP in patients with ocular hypertension or glaucoma. Although the IOP lowering effect of travoprost 0.004% eye drops was the highest IOP mean reduction rate when compared to other anti-glaucoma drugs as monotherapy, but it was not commonly prescribed at Elsaym Ophthalmic Hospital due to its high price. [Table 4] showed the significant (P = 0.001) IOP lowering effects of the combination of once daily doses of timolol 0.1% eye gel and travoprost 0.004% eye drops for treatment of OAG patients (n = 8). The total mean IOP reductions of this combination were 8.9 mmHg for the right and 10.4 mmHg for left eyes representing 40.5% and 40% reductions, respectively. The IOP lowering effects of the combination of twice daily different doses of eye drops of timolol 0.5% and brinzolamide 1% for treatment of 40 OAG patients were shown in [Table 4]. The total mean IOP reductions of this combination were 7.7 mmHg for the right and 8.8 mmHg for the left eyes representing a significance of (P = 0.00) reductions of 33% and 35%, respectively. Michaud and Friren reported that treatment regimens of eye drops of timolol 0.5% plus brinzolamide 1% eye drops reduced IOP significantly at all time points. Results in [Table 4] demonstrated the IOP lowering effects of the combination of once daily dose of timolol 0.1% eye gel and twice daily doses of brinzolamide 1% eye drops when it was used by 31 OAG patients. The significant (P = 0.001) total mean IOP reductions of this combination were 7.5 mmHg for the right eye and 6.3 mmHg for the left eyes representing reductions of 33.5% and 30.1%, respectively. The use of this combination produced additive effect when compared to the use of timolol 0.1% eye gel alone. The significant (P = 0.001) IOP lowering effects of a fixed combination of twice daily doses of timolol 0.5% and dorzolamide 2% eye drops plus once daily dose of travoprost 0.004% eye drops in treatment of 6 patients with OAG were demonstrated in [Table 5] and [Figure 2]. The total mean IOP reductions of these agents were 12 mmHg for the right and 12.7 mmHg for the left eyes, representing reductions of 46.5% and 44.3%, respectively. It was observed that this type of combination produced an additive IOP lowering effect and it was found to produce superior IOP reductions over all other combinations which were used for lowering IOP in this study. In this study, 150 (75%) of the patients with OAG used their medications on regular basis as prescribed by their ophthalmologists which reflected a considerable degree of compliance with treatment. A good follow-up and better cooperation of patients are considered essential for effective treatment and prevention of further visual loss. For treatment of OAG and according to this study, it was evident that combined therapy prevailed over monotherapy [Table 2] and [Table 5]. At Elsaym Ophthalmic Hospital, monotherapy was prescribed for 82 (41%) patients while 118 (59%) patients received combined therapy. This may be due to delayed diagnosis of OAG, which may lead to advanced damage to the optic nerve and visual field defects, therefore IOP reduction with combined therapy is needed for protection of the optic nerve and hence visual field from further damage. Although monotherapy is recommended but in practice most patients will eventually require several different types of glaucoma medications. Great attention should be given to drugs which have more therapeutic values in IOP reduction such as timolol and travoprost as mono or combined therapy. Also special screening programs targeting individuals suspected to have glaucoma will eventually allow diagnosis and treatment of glaucoma at its earlier stages and hence, restrict the incidence of glaucoma complications. Duvall BS, Kershner RM. Ophthalmic Medications and Pharmacology. 2nd ed. Boston: SLACK Incorporated; 2006. Khaw PT, Shah P, Elkington AR. ABC of Eyes. 4th ed. London: BMJ Publishing Group Ltd.; 2004. Khurana AK. Comprehensive Ophthalmology. 4th ed. India: New Age International (P) Limited; 2007. Marrison JC, Pollack IP, editors. Glaucoma Science and Practice. Hong Kong: Thieme Medical Publishers Inc.; 2003. Edgar DF, Rudnicka A. Glaucoma Identification and Co-management. China: Elsevier Ltd.; 2007. Damji KF, Behki R, Wang L; Target IOP Workshop Participants. Canadian perspectives in glaucoma management: Setting target intraocular pressure range. Can J Ophthalmol 2003;38:189-97. Diestelhorst M, Nordmann JP, Toris CB. Combined therapy of pilocarpine or latanoprost with timolol versus latanoprost monotherapy. Surv Ophthalmol 2002;47 Suppl 1:S155-61. Netland PA, editor. Glaucoma Medical Therapy: Principles and Management. 2nd ed. New York: Oxford University Press; 2008. Weale RA. Ethnicity and glaucoma: Higher environmental temperatures may accelerate the onset, and increase the prevalence, of primary open-angle glaucoma. Med Hypotheses 2007;69:432-7. Cedrone C, Mancino R, Cerulli A, Cesareo M, Nucci C. Epidemiology of primary glaucoma: Prevalence, incidence, and blinding effects. Prog Brain Res 2008;173:3-14. Lang GK. Ophthalmology: A Pocket Textbook Atlas. 2nd ed. New York: Thieme; 2006. Giaconi JA, Law SK, Coleman AL, Caprioli J, editors. Pearls of Glaucoma Management. London: Springer; 2010. Wilson MR, Kosoko O, Cowan CL Jr., Sample PA, Johnson CA, Haynatzki G, et al. 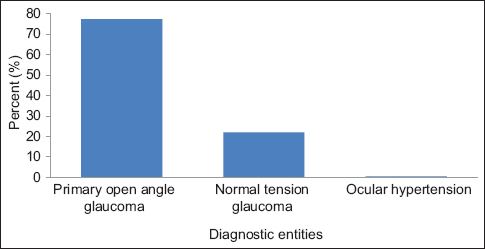 Progression of visual field loss in untreated glaucoma patients and glaucoma suspects in St. Lucia, West Indies. Am J Ophthalmol 2002;134:399-405. Wong TY, Klein BE, Klein R, Knudtson M, Lee KE. Refractive errors, intraocular pressure, and glaucoma in a white population. Ophthalmology 2003;110:211-7. Sohn SW, Song JS, Kee C. Influence of the extent of myopia on the progression of normal-tension glaucoma. Am J Ophthalmol 2010;149:831-8. Pasquale LR, Kang JH, Manson JE, Willett WC, Rosner BA, Hankinson SE. Prospective study of type 2 diabetes mellitus and risk of primary open-angle glaucoma in women. Ophthalmology 2006;113:1081-6. Mirghani M, Hawker M, Izeldin M. Glaucoma clinic guidelines at Alsaym ophthalmic hospital. Wad Medani Area, Central Sudan: 2007. Hedman K, Larsson LI. The effect of latanoprost compared with timolol in African-American, Asian, Caucasian, and Mexican open-angle glaucoma or ocular hypertensive patients. Surv Ophthalmol 2002;47 Suppl 1:S77-89. Shedden A, Laurence J, Tipping R; Timoptic-XE 0.5% Study Group. Efficacy and tolerability of timolol maleate ophthalmic gel-forming solution versus timolol ophthalmic solution in adults with open-angle glaucoma or ocular hypertension: A six-month, double-masked, multicenter study. Clin Ther 2001;23:440-50. Hellberg MR, McLaughlin MA, Sharif NA, DeSantis L, Dean TR, Kyba EP, et al. Identification and characterization of the ocular hypotensive efficacy of travoprost, a potent and selective FP prostaglandin receptor agonist, and AL-6598, a DP prostaglandin receptor agonist. Surv Ophthalmol 2002;47 Suppl 1:S13-33. Schuman JS, Katz GJ, Lewis RA, Henry JC, Mallick S, Wells DT, et al. Efficacy and safety of a fixed combination of travoprost 0.004%/timolol 0.5% ophthalmic solution once daily for open-angle glaucoma or ocular hypertension. Am J Ophthalmol 2005;140:242-50. Barnebey HS, Orengo-Nania S, Flowers BE, Samples J, Mallick S, Landry TA, et al. The safety and efficacy of travoprost 0.004%/timolol 0.5% fixed combination ophthalmic solution. Am J Ophthalmol 2005;140:1-7. Michaud JE, Friren B; International Brinzolamide Adjunctive Study Group. Comparison of topical brinzolamide 1% and dorzolamide 2% eye drops given twice daily in addition to timolol 0.5% in patients with primary open-angle glaucoma or ocular hypertension. Am J Ophthalmol 2001;132:235-43.